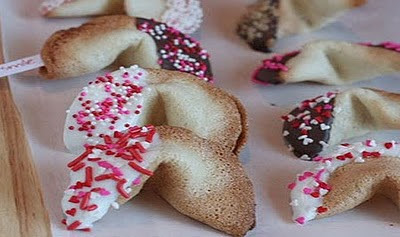 Did you realize that Valentine's Day and Chinese New Year land on the same day this year?! It’s like “Double Happiness” on this Sunday February 14th! Many of you already know about the valentine’s day, so I am dedicating this posting to Chinese New Year. As an Chinese American, this is the special time to remember our Chinese heritage & celebrate our traditions! Even the U.S. 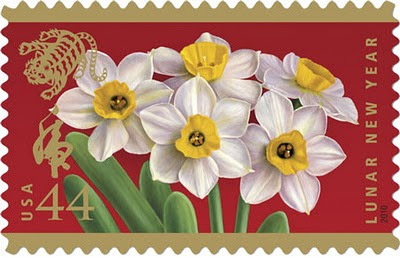 Postal service has special stamps to celebrate the year of Tiger. 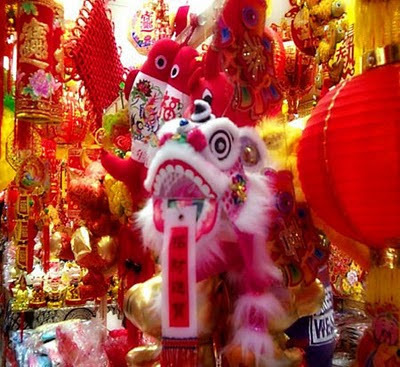 The Chinese New Year is regarded as one of the most important Chinese holidays. 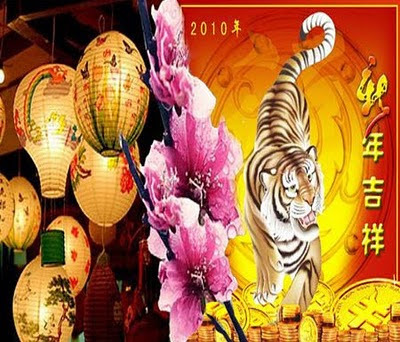 The celebration starts on the first day of the first month in the Chinese calendar and ends on the day of the Lantern Festival on the fifteenth. A big feast marks the Eve of Chinese New Year (for this year it will be February 13th), complete with traditional Chinese dishes. ON the new year day, children receive money in red envelopes we called it “hongbao 红包” from their parents and everybody wishes each other good health in the New Year. 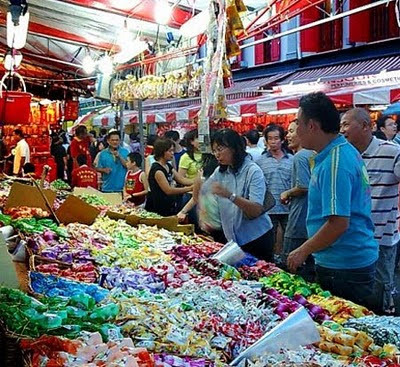 The first day of Chinese New Year is a time when families visit the oldest and senior members of their extended family, usually their parents, grandparents or great-grandparents. Not everyone follows the same traditions for Chinese New Year. In northern China, families eat dumplings after dinner, while in southern China they eat rice cakes. Dumplings symbolize wealth, and rice cakes symbolize a prosperous year. 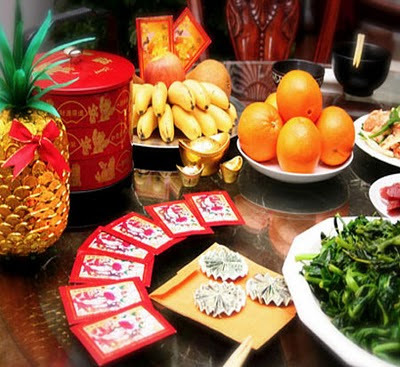 Some rituals go beyond food and gift giving and can include lighting firecrackers, invite a lion dance troupe as a symbolic ritual to usher in the Lunar New Year, as well as to evict bad spirits from the premises. 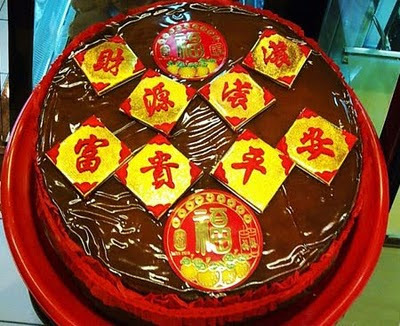 Chinese New Year rice cake – “Nian gao” (年糕) sounds like “年高”, which literally means “increasingly prosperous year in year out”. 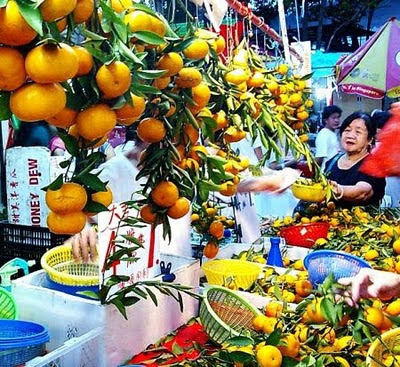 Tangerines and Mandarin oranges symbolize abundance and happiness and are a must-gift when visiting relatives and friends. 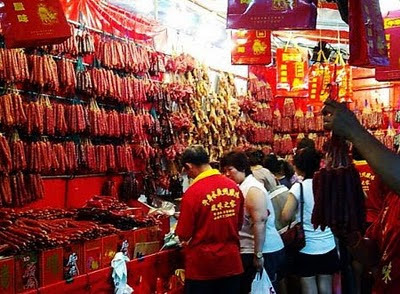 In Chinatown or Chinese supermarkets, people were busily buying stuffs for the Spring festival. The color Red is liberally used in all decoration during this festive season. Red symbolizes good fortune. There is an ancient Chinese legend about a man-eating beast called “Nian” which is a predatory creature. 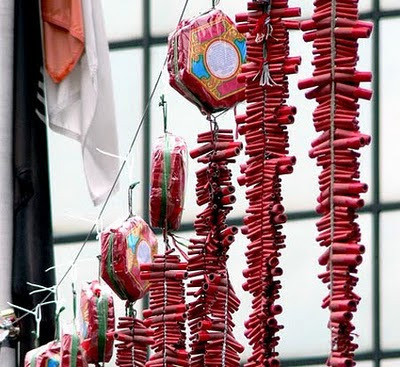 To scare off Nian, people covered their homes with the color red and filled the air with loud noises, ie. fire crackers. 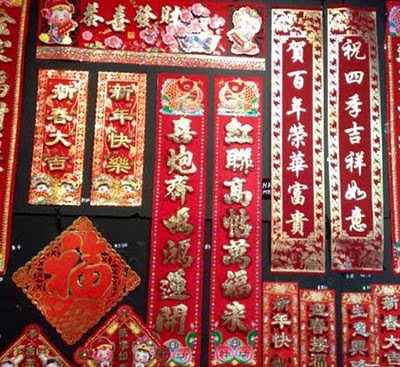 Chinese like to grace their gates and doors with Chinese New Year’s couplets which are written on two strips of red paper. The red couplets are composed of sentences that complement each other and often rhyme. Nowadays, we hardly see handwritten couplets; these are all printed with different designs. Even the house of CHANEL dedicated a pre-fall 2010 collections to the “China Chic”! Here are some photos of this fabulous collection show at Shanghai, China. Click on the media player below to view this fabulous fashion show! So after reading and seeing all these festive Chinese new year stuff, are you all inspired and start thinking how to celebrate this Sunday? Well, here is a great idea how you can celebrate the Chinese New Year & Valentine’s day together and make it a very special “Double Happiness” holiday weekend! Place all ingredients in a food processor and blend to combine. Place in a container and chill 1 hour. Preheat oven to 400°. The batter couldn't be simpler. 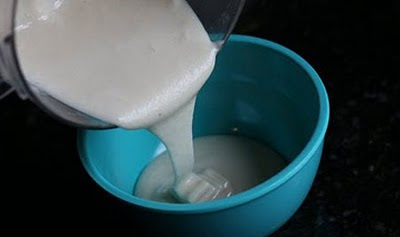 Just throw all of the ingredients (egg whites, sugar, flour, and vanilla) into a food processor and blend it up. You could also probably do it in a blender, or whisk it very well. You want zero lumps. Pop that mix in the fridge for an hour and while it's chilling you can prep the rest of the ingredients. First, you'll need fortunes! 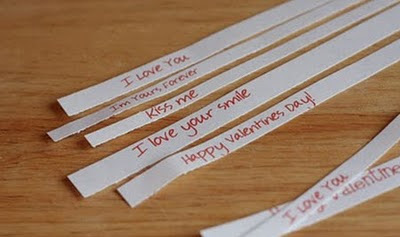 Since we're making Valentine cookies today, filled them with little love notes. Be creative! When your batter is chilled, place 1 teaspoon on each circle and spread it out with a small spoon to fill the circle on a plain baking sheet. Pop the pan in the oven for about 6 minutes till you see it is brown around the edges and a little towards the center. If you underbake them they will be chewy instead of crunchy! This is the part is a little tricky, but you’ll get the hang of it fast. 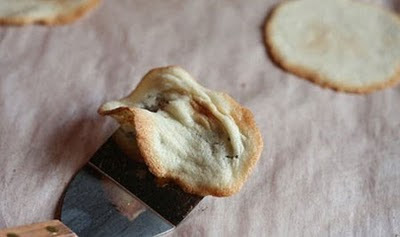 If you try to take the cookie off the pan too quickly, it will mush up like this! but if you leave it on too long (and I'm talking seconds here), it will firm up so much that you can't shape it. So the trick is to find that perfect time. I find that it only takes about 15-30 seconds after they come out of the oven before I can get them off the pan. Use a spatula like you see in my pictures with a nice sharp edge. I thick plastic one won't work very well. 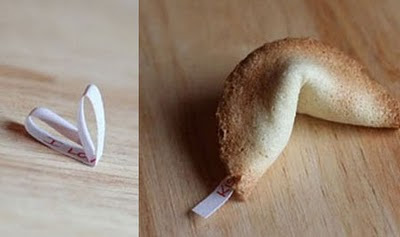 You can leave the fortune paper peeking out so it hangs out. They only take a minute to cool and you can pack them right up! 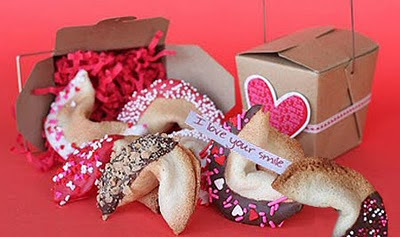 Since it’s the Valentine’s day is the same on the same day as Chinese new year, you can pretty up the fortune cookies with some V-day decorations. 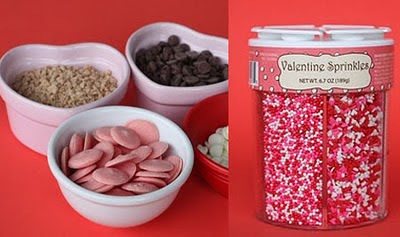 You can use chocolate, almond bark, candy melts…etc and then sprinkle on any toppings you want. Just dip & sprinkle anyway you like it! 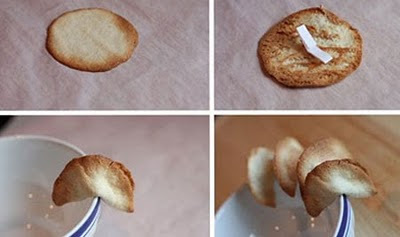 dip half the cookie, the outer edge, or drizzle, or whatever! 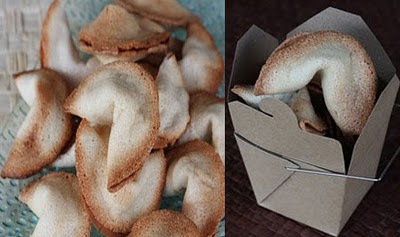 Combining the festive mood of Chinese New Year & Valentine’s day together by packaging the fortune cookies in some cute Chinese take-out boxes that you can buy from any craft stores. Decorate anyway you like it, ribbons, glitter, lace, heart shape cut-out paper… let your imagination run wild! 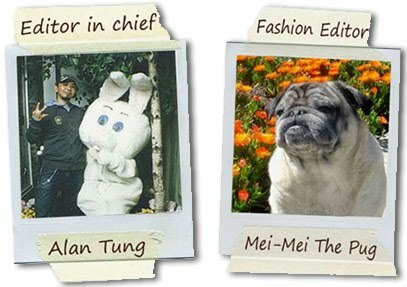 We hope you enjoy this special Chinese New Year - Valentine’s day posting! Now go to your closet, find some fabulous RED color clothing, accessories or shoes and celebrate these two holidays “China Chic” style! Here is a documentry film about the "Lantern Festival" in Taiwan. The Chinese new year celebrations last 15 days and ends with the Lantern Festival, it's a magical holiday! Wanna also dress up your home in "China Chic" style? come check out our Asian inspired designer home fragrance collections by "L'Objet", the handmade candles are encapsulated in a 14K gold plated Red Chinese theme vessel created from fine limoges porcelain paste, the candles exude the intoxicating scent of pink champagne. It's a must have! 中國新年快樂 (Happy Chinese New Year) !